Certain places on earth can serve as powerful aids in outer and inner journeying. 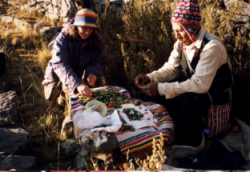 I have been taking groups to Peru and Bolivia since 1999 when I attended my first shamanic conference at Lake Titicaca. It was organised by Jorge Luis Delgado and there were Andean cosmologists, coca leaf readers and shamans from around South America. We were lead in sacred ceremonies by local shamans and the opening of the fourth 11.11 gate at the interdimensional doorway. We also worked with Pacha Mama (Mother Earth) and the Apus (Mountain Spirits). The experience was so amazing and the people so beautiful, that I was inspired to share this with others by taking groups. Upon arrival each year we are greeted with "Welcome Home" and it really does feel like you are answering a call to return. We travel in small groups by plane, train, private boats and buses, with our own guides and interpreters. 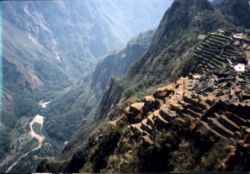 We visit some of the major sacred sites such as Machu Picchu, Cusco & Sacred Valley, home of the ancient mystery schools. 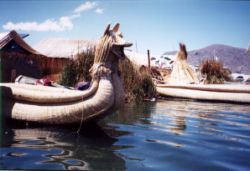 Also Lake Titicaca with its Islands of the Sun & Moon, Peace & Love and Uros Floating Reed Islands, plus Tiwanaku, Sillustani, Copacopana, Aramu Muru Doorway, Nazca Lines, Amazon and more; where we work with local shamans joining them in ceremony and meditations. Their wisdom and feeling is inherited from generations of this work with the Earth. There have been many ceremonies since, the activation of the golden solar disc, the 11.11.11 and the 12.12.12. Looking forward to many more in the future, will you be a part of these??? Enjoy the vibrant atmosphere of the local villages and market places where you will be tempted to buy hand-woven alpaca wool rugs and clothes, hand crafted jewellery and unique artefacts at very reasonable prices. The sounds of the Andean music will resonate in your memory forever. We stay in a variety of accomodation from mostly 4 star hotels to rooms in the villager's homes, thus meeting the colourful local people and experiencing their generosity. Usually we go on these journeys for approximately 3-4 weeks including travel time and the itinerary changes each year. Sometimes we stop over at Easter Island for a few days, sometimes we visit the Nazca area and fly over the Nazca Lines, or we visit Bolivia or the Amazon Rainforest. For each person who joins me on one of these tours, I sponsor the establishment of income producing village based activities in remote communities in the High Andes Mountains. Such as food production, general health & nutrition, new education skills & technologies etc. through my partnership with True Living Heart foundation. Easter Island is known by the locals as Rapa Nui and is famous for its huge stone statues. On my first visit to this tiny island in the middle of the Pacific Ocean between Tahiti and Chile, I met and stayed with Anna, who was as a young girl, guide to Thor Heyerdahl when he was studying there. He was the famous archeologist/explorer who set out to prove that the ancient Incas from Peru, Equador and Chile could have built reed boats and travelled across to Easter Island. He was responsible for the Kon-Tiki Expedition and had a raft built from the Lake Titicaca reeds and sailed across in 101 days. He also spent several years there researching the giant stone statues and stone work and found amazing links with pre Inkan Peru. Today there is a strong Polynesian influence in the local culture. The tiny triangle shaped island has a volcano on each corner, with lakes in their craters and over 20,000 archeological sites. The month I spent in Peru with Judy and the group was one of the most amazing times in my life. The energy of the place and the unbelievably kind people who reside there is something that just has to be experienced. It was a stark reminder that we all need to unclutter our lives. We spent a month hiking to Spiritual sites with Shaman, doing ceremony and meeting some amazing local people. The conference at the Lake Titicaca had about 250 people from all over the world and many local Shaman, all gathered together for one purpose - to activate the golden solar disc. I met some really amazing people at the conference and I have kept in close contact with them. The experience was just too great to really describe in words. Even the food was unbelievable, it was such a high energy it didn’t take much to sustain you. I lost a bunch of weight (emotional and physical) and feel so much better for it. Since being home and back at work, everything is different. I highly recommend taking a power place journey with Judy, you will never be the same again. In June 2015 we visited Uluru for a week including a visit from His Holiness, the Dalai Lama. Included was 6 nights accommodation in cabins at the campground, entry into the National Park, tickets to see His Holiness, private guided tours around the base of Uluru, to the Valley of the Winds, Kata Tjuta, & to Cave Hill Rock Art site, sunrise and sunset viewing of the rock, transfers from and to airport, visit to the Cultural Centre, free time to rest by the many swimming pools etc. If you would like to join us for 2 weeks usually in April, visiting places like Alice Springs, The East and West Macdonnell Ranges, Rainbow Valley, Uluru & Kata Tjuta, Cave Hill rock art site & Kings canyon etc, please contact us for the itinerary. This amazing photo of the double rainbow was taken by Gwenn Starr. 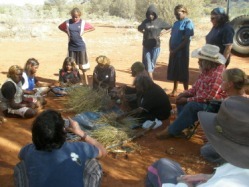 Experience a day with Anangu traditional owners out on their lands, learning about local culture and the 'Tjukurpa' (traditional law/lore), bush tucker and medicines. This is a unique opportunity to exchange ideas and interact with the local people and see how they survive in this harsh environment. Depending on the season you visit the area, you could experience digging for witchetty grubs, eating bush lollies, drinking grevillea 'lemonade' or eating honey ants. You will also see how to make 'Kiti' (spinifex glue) and its many uses, as well as learn about the many medicinal plants in the area. Walk around the base of the rock while listening to stories of the Dreamtime. A lot of visitors come to Uluru just to climb the rock and view the sunset, but the Anangu prefer that we don’t climb, suggesting that we walk around the base instead. It makes the locals sad that visitors swarm like ants over the tracks of their ancestors simply to get to the top. There is much more to be learnt by visiting the sites around the base of Uluru including rock art sites. You will also be guided through the brilliant desert night sky with stories from a variety of cultures from around the world and will learn to recognize some of the constellations & planets and gain a greater insight into our place in space. Geoff, who will be your guide has experience as a ranger & a tour guide at Uluru, as well as a night sky guide for the 'Sounds of Silence' several years ago. Walk the Valley of the Winds and Olga Gorge at Kata Tjuta & visit the Cultural Centre. Also a day trip to Cave Hill Rock Art Site, place of Seven Sisters Dreaming. Visit Watarrka National Park (Kings Canyon) and walk the rim to places like the Garden of Eden and the Lost City, plus Kings Creek Station. Also visit the East and West MacDonnell Ranges with places such as Simpson's Gap, Ormiston Gorge, Ellery Creek Bighole, Standley Chasm, Trephina Gorge, Jessie & Emily Gaps etc. Also Alice Springs & the Desert Park, galleries, museums etc. and spend a day with a traditional healer or Nungkari, Frank Ansell, where everyone who wishes can purchase a jar of his bush medicine to take home with them. We will be staying in self-contained cabins at Yulara Campground, Kings Canyon Resort and Alice Springs Holiday Park and there will be free time to do your own thing like scenic flights and Camel rides, dinner in the desert, Harley rides and swimming in the pools. I wanted to let you both know how much I enjoyed my two weeks in Alice and Uluru, it was amazing. I know if I hadn't been with you both my experiences would have been very different. I can't believe how much we did, saw and learned. I feel very privileged. I already miss the red sand, art and general vibe of the desert. I have made contact with an artist run contemporary gallery in Alice Springs called Watch this Space and I am donating a drawing to a fund raising exhibition in May, titled 60 000 Artists, it's to do with artists interpretation of climate change on the planet. I feel like this opportunity is just the beginning for me to be involved with life in the Desert. Thank you both so much, you are both such beautiful, patient people.
" It was fantastic ! We had a great time. There are many beautiful and amazing places to see. The local indigenous stories add to the enjoyment and appreciation of the areas. The indigenous hosts we met are friendly and generous in sharing their knowledge and stories. We felt genuinely welcomed by them. All with wonderful traveling companions." 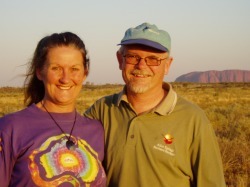 Just wanted to say another thank you to you and Geoff for all you provided on our trip to Uluru. I had a feeling it would be an amazing journey and it was. Thanks so much for your organisation and the care and love you and Geoff offered from the moment we started out. Just a note to say THANKYOU for all the work you did in organizing Uluru. Certainly a wonderful experience and a magical place; highlighted also by Geoff’s knowledge of the area and wonderful stories of myths and legends. A wonderful insight of the stars and planets has inspired me to do more stargazing. A great experience for the reconnection to our Earth Mother. Just would like to thank both of you for such an amazing trip!! It was not only one of the best learning experiences I’ve had yet but an extremely enjoyable one!! It was great to meet new people and the memories will last forever. We will stay in good contact and I’m looking forward to going on another trip with you in the near future. Sincere thanks once again. Just wanted to say a big thank-you for such an awesome trip to Uluru. I appreciate all of your organizing which allowed me to really relax and take everything in. Thank-you both for your patience and understanding when “my stuff” was moving. It was wonderful to feel so loved and supported. 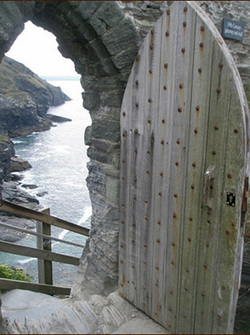 Join us on an adventure guided by the extraordinary Tor Webster, our Avalon expert, through the mysterious lands of SW England. 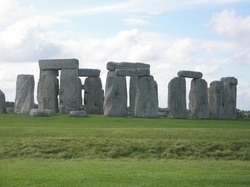 Visit places like King Arthurs Tintagel, Merlins cave & St. Nectan’s Glen in Cornwall; & Woodhenge, Stonehenge and Avebury stone circles, Silbury Hill and West Kennett Longbarrow in Wiltshire. Then in the mystical Glastonbury, (Heart Chakra of the planet) we will hear stories of Mary Magdalene, Joseph of Arimathea, Archangel Michael and the Christ, as we weave our way across the ley lines through these lands. See standing stones, waterfalls, holy springs, ancient trees 2,000 years old and more. Visit the “Underworld” shop owned by Paul Broadhurst (co-author of “The Sun & the Serpent” with Hamish Miller, world famous dowser), and the “Witchcraft Museum” as we delve deeply into the sacredness of this ancient Celtic land. I lived in Morocco for 2 years back in 1980s and learnt to speak Arabic which comes in very handy travelling around there. I also have family (in-laws) living there and have returned a few times over the years to visit them and friends. After going back and taking our daughter to see her grandmother and cousins etc. in 2011, then again in 2015, people who had been to Peru or Central Australia with us started to ask me to take them over, so this destination was added to my trip list. We will visit places like Marrakech with its famous “Jma El Fna” square with acrobats, musicians, story tellers, bell ringing water carriers and snake charmers etc. Plus the Koutoubia Minaret & Mosque where 5 times a day the call to prayer for Muslims echoes across the city, the beautiful Yves St. Laurent garden, “Jardin Marjorelle”, with art gallery, its water features and plants from across the world, a peaceful haven amidst the chaos of the city. Get lost in the souk, where kilometres of labyrinth like passage ways lead past market stalls & weave on and on forever in every direction. Go shopping or just photograph things such as leather goods, gold or silver jewellery, ceramics, carpets, olives, spices, nuts and fruits, clothes etc. If you do lose your way, ask a shop keeper for directions back to the Jma El Fnaa square, where in the early evening it comes alive and we can have dinner here and watch the scene unfold. The stunning Ourika valley is just outside Marrakech and Setti Fatma is where the road of Route d’Ourika ends in the High Atlas Mountains. We will stop at the village of Setti Fatma which has numerous little outdoor restaurants along the river bank, a few souvenir shops & guides to lead the way to the famous waterfalls. On the way back visit medicinal botanical gardens, see Argan oil being pressed, pottery being made and fired and traditional village house etc. Next we head to Essaouira on the Atlantic Coast, where we can start the day with a hammam, the traditional bath house, then walk through the old town or medina with Samira as our guide. Also a trip to the souk or market place to see the spices, silver, carpets, leatherwork etc., then buy food for our Moroccan traditional cooking class, which we can then eat on our roof top terrace. Visit the Thuya wood workers at the Skala, the artists and the Ramparts with stunning views across the Portuguese brass cannons overlooking the sea, the harbour and the islands of Mogador. Harbour visit to see fresh fish and buy sardines straight off the boats & cooked while you wait. If you feel the call to join us for 3 weeks, please contact us now for the itinerary. 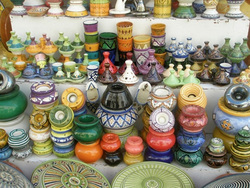 Or you may feel to only do one part - just Morocco for 12 days, or similarly, just SW England for 8 days. Enquiries are welcome for prices for whole journey or either part of the trips. Accommodation will be in Bed and Breakfasts, hotels or self contained apartments on a twin share arrangement, unless otherwise requested.